Wow, time got away from me like crazy today. I am not used to spending the whole day out on Tuesdays as I usually take it easy since it is my church night. It is all I can do to make it there on time some days so I try not to add anything much to Tuesdays. This time however, the night was switched to Thursday and so Spencer and I went to the park, for ice cream and did a few errands. I hardly slept last night so when we got home, we had a bath and a long nap and I am still tired. I know, get to the ATC already. I just wanted to explain why I have only an ATC and not a full card to show you today. I am going to turn the other ATC I did into a card later today and add it to this post in the afternoon. 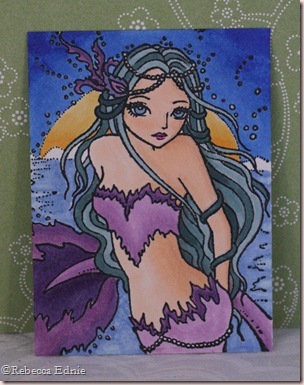 I coloured this one for a Non-Cutesy Mermaid swap on Swap-Bot. It was actually a lot more vibrant IRL if you can believe that. I tried different lighting including sunlight but I just couldn’t capture it. Oh well. ETA: Here is the card I am finally getting to post at 11PM, eek! This is the ATC I did that became my feature image for this card. It was going to be for a PRO Artists ATC swap (yep, I was accepted!) but it wasn’t quite PRO enough for me yet it was just asking me to do something with it. For all of you who think ATCs are cool but don’t know what to do with them, this is it! Trade ‘em with your friends and then challenge each other to make cards with ‘em. It is fun, I promise! Although it looks like the background here is white, it is actually a pale blue with purple tones to it, B60. A lighter version of the colour I used for the leaves made from dotted lines (click for a larger image) in the top left corner. Is that seaweed? or is she on land and that is a hanging vine? Anyway, I used Heather’s DD, Piper’s sketch. 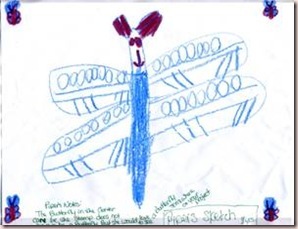 According to the notes she had her mom include, the butterfly image was not required nor were all 4 of the corner butterflies. So cute huh? Thanks to Sweet Pea stamps for being our Sponsor this month. I would NEVER have bought them but I am having SO MUCH FUN colouring them and I am SOOO GLAD to have them!! It is so freeing colouring a fantasy image that really has no rules for the colouring. I like to keep the skin tones natural, that’s just me but other than that… anything goes. Be sure to check out the Whimsical Wednesdays blog to see the sketches, yep two of them, for this week and I will add the one I plan to use when I add my card later. (ETA DONE!) Be sure to upload your project to online galleries using DDSC36 and link it up with Mr Linky. Don’t forget to visit all of the DareDevil’s blogs and leave them some great comments. Wow Rebecca, these are both stunning!! Gorgeous coloring!! Someone will be very lucky to get these! Very pretty ATC! Hope you feel better!